If you (like me) are making the switch from standard skincare products (which are often loaded with toxic chemicals) to healthier and more natural alternatives, you may have found (like me) that ridding yourself of unwanted parabens and propylene glycol has an unwanted side effect: lightening your wallet. Often natural and organic products come with a price tag that can be a bit daunting in comparison to their unhealthy counterparts. But does leaving out the bad ingredients have to mean shelling out big bucks? It's called Noah's Naturals and, with every product in the line under $10, it's completely affordable. I tried the Facial Starter Kit which contains the Anti-Aging Gel Cleanser, All-Day Moisture and Gel Serum. With the cleanser, it's super-foaming so a little really goes a long way. It cleansed my skin without leaving it dry or tight. I could have done without the fragrance, although the ingredient listing said it was "naturally derived." In any case, it didn't irritate my sensitive skin at all. The moisturizer also has a bit of naturally derived fragrance--although not quite as much as the cleanser. It had a light texture that hydrated my skin quite nicely. No SPF, but still a great way to nourish your skin. The Gel Serum was my favorite product. No fragrance that I could discern and chock full of great ingredients like safflower oil, sweet almond oil, Vitamins A and E. This is a thick, rich serum so it goes on a bit heavier than most--but it's very soothing and absorbs into the skin after a few minutes. I really liked it. 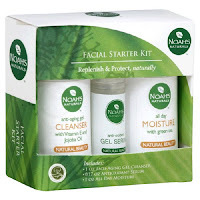 So if you're looking for a way to break free of chemical-laden skincare products without breaking the bank, Noah's Naturals (which can be found in Walgreens and Wal-mart) might just be the ticket.